Misuse of prescription opioids continued its 10-year decline. Virtually all other substances are at their lowest point in the history of the survey. The contrast is very significant, because many people think the overprescribing of opioids is the only reason our youth die of drug abuse. They fail to reflect on the fact that early marijuana use is a predictor of other substance abuse. They also fail to understand that marijuana is frequently among the drugs found in those who die in overdose deaths. “We would be in a period of low substance abuse for youth if it weren’t for cannabis,” asserted David Rettew, MD, of the University of Vermont. ** He added that the kids using it now might otherwise not be using any substances at all. 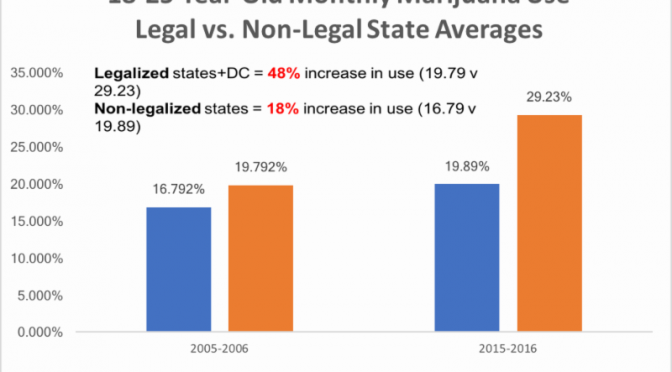 Just last week, other data from the federal government found that Colorado was the #1 state in the U.S. for first time marijuana users 12 and over. 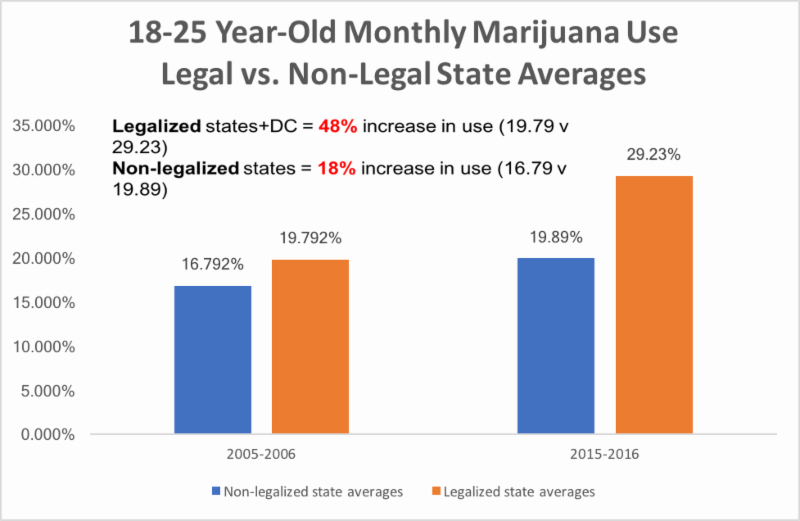 Young adult use also soared in legalized states at a much faster rate than in non-legal states. “The marijuana industry is today’s Big Tobacco,” according to Kevin Sabet. He blames businesses that market vapes, marijuana edibles and other highly potent forms of THC. 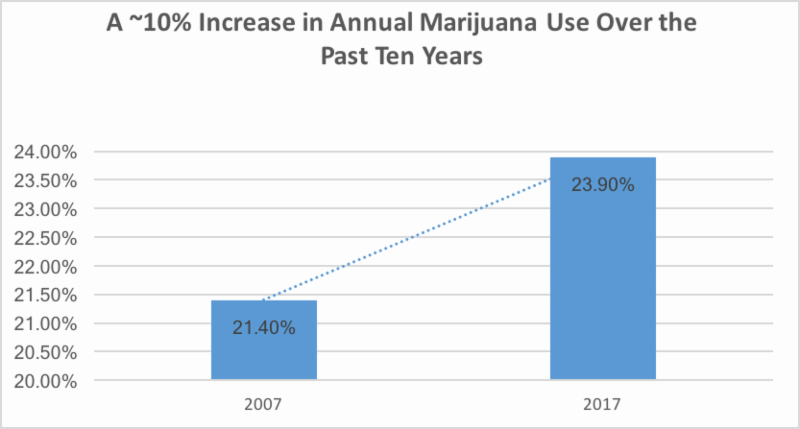 Monitoring the Future blames the increase of youth use on the declining perception of marijuana as harmless. Overall, 43,703 students from 360 public and private schools participated in this year’s MTF survey. 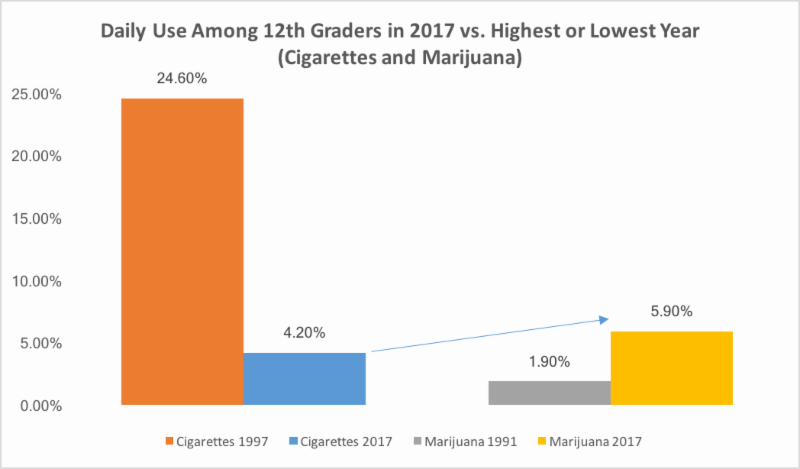 Since 1975, the survey has measured drug, alcohol, and cigarette use and related attitudes in 12th graders nationwide. Eighth and 10th graders were added to the survey in 1991. Questions are also asked about daily cigarette and marijuana use. NIDA has provided funding for the survey since its inception by investigators at the University of Michigan at Ann Arbor. Dr. Richard Miech currently leads the study. MTF is funded under grant number DA001411. Additional information on the MTF Survey can be found at www.drugabuse.gov/drugpages/MTF.html. The University of Michigan press release can be found at http://monitoringthefuture.org.